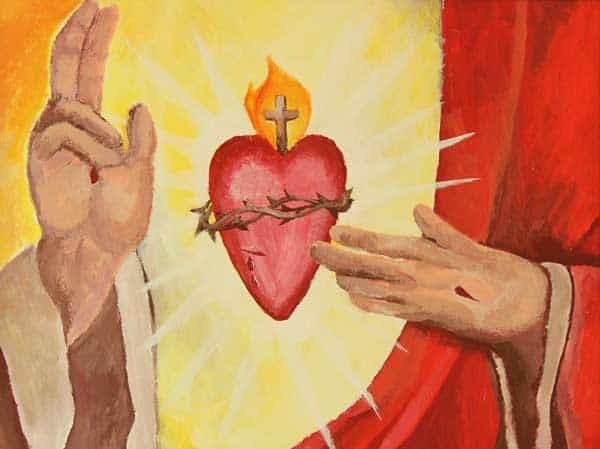 Home » Articles » What is the Sacred Heart of Jesus meaning and history? The history of the devotion to the Heart of Jesus is very rich and extraordinary. Nobody finds it strange that it may be said that the first devotee of the Heart of Jesus was St. John. It is he who tells us that “one of the soldiers thrust a lance into His side and immediately blood and water flowed out” (Jn 19, 34): water, symbol of Baptism, and blood, symbol of the Eucharist. It is St. John who describes to us the open side of the Lord, after the Resurrection, when he appears again to all the Eleven, gathered together, and invites St. Thomas to put his hand into his open side (Cf. Jn 20, 26-29). It is still St. John, author of the Book of Revelation, who mentions Jesus’ pierced side (Rv 1, 7). The special friend of the Lord, who reclined his head on His chest, during the Last Supper, is the first devotee of the pierced Heart. Meanwhile, for centuries, several sacred writers, such as St. Clement of Alexandria, St. Leo the Great, St. John Chrysostom and others, mentioned the pierced side of the Lord and made precious comments on it. thus finding in that Heart the source of all gifts and graces. However it was to be later, specially from St. Bonaventure on, that the literature about the Heart of Jesus and the relationship between the physical heart of Jesus and the mystery of His love is more pronounced. Then there appear also two great writers talking about the Heart of Jesus: St. Francis of Sales (1567-1622) and St. John Eudes (1601-1680), who expanded the devotion to the Sacred Heart of Jesus. The first inculcates in the Order of the Visitation, which he founded in 1610, a particular devotion to the Heart of the Redeemer and addresses his visitandine nuns, when writing to them, as “daughters of the Heart of Jesus”. The second, St. John Eudes, besides promoting this devotion, composed an Office (for the Liturgy of the Hours) and a Mass in honor of the Heart of Jesus, which were first celebrated in various locations of France, on September 20, 1972. St. Margaret Mary, of the Order of the Visitation (1647-1690), and the Jesuit St. Claude de la Colombière (1641-1681), confessor of St. Margaret Mary and also writer and preacher of this devotion. The apparitions to St. Margaret Mary are, in fact, an important point in the knowledge and expansion of the devotion to the Heart of Jesus. Because St. Claude was a Jesuit, the Society of Jesus was put in charge of spreading the devotion to the Heart of Jesus. Many other writers, saints and mystics have a special place in this history of the devotion to the Heart of Christ Jesus. In Portugal, it was the Blessed Maria do Divino Coração, a religious Sister of the Good Shepherd, that was charged by Jesus himself with writing to Pope Leo XIII, thus obtaining the great grace which was the Consecration of Humankind to the Heart of Christ, made on June 11, 1899. On the Centennial of this Consecration, Pope John Paul II made public a letter sent to the entire Church about this devotion. And Benedict XVI, on the fiftieth anniversary of the great Encyclical of Pius XII on the Heart of Jesus, sent another letter, this time to the Father General of the Society of Jesus, about this devotion. He even stated, in that letter, that his first Encyclical, “God is Love”, was born of the pierced side of the Lord. Thus we have, from the Apostle St. John up to Benedict XVI, a wonderful history of eminent figures talking to us about the pierced Heart of Jesus as fount of life and love.